Hello, stranger. Care to walk with me a while? I like this path. I’ve not walked this one before, isn’t it beautiful? It’s so easy to forget, when you’re not walking a path like this, just how incredible the world can be. Isn’t it just wonderful, though? Those perfect oceans of bluebells, so neatly curving off to make a pathway for us through the green of the great bushy trees all around us, with massive leaves and thick verdant bushes a natural fence, leading us on our way. The feeling, too! The feeling of these soft things underfoot; the delicate crush of the bluebell under your feet, and the quiet joy watching it rise back to form once you step away. Aye, I wish there were more of these paths too. But perhaps it’s important there aren’t too many; I’ve met some fellows on these paths who just walk back and forward, refusing to ever leave. They’re the ones I feel sorry for, the ones who’ve forgot. Sure, it’s difficult to remember the beauty of these places when you leave; when you’re walking through the oceans of salt and the slag drifts; but then you find another path, and you remember again. If you never leave, you forget just how wonderful where you are truly is; it becomes commonplace. If you ever grew too used to a place like this, you’d never be able to step off onto the siltstreets and saltways beyond; you’d be trapped on a single path! I saw a wonderful lane of magnolias recently, interrupted occasionally by a checkerboard of daisies and buttercups. It was a short lane, sadly; when I’d finished it once I was so, so tempted to turn my heel and walk it again. But that’s how it starts; that’s how the madness takes you. Because the drifters, the ones who never leave the paths, they still have to face the endings; they still look out on the dregs and the salt, they just choose to turn about. But that means they only have endings left; they only see the ends of their paths, never new beginnings. What a sorry way to be. There was one, a long time ago, where I think I saw stars. No, honestly! The boundary trees were pine, but they weren’t too thick, and the canopy was light. It was an incredible view; to step from the siltway, staring up at ash clouds and a salt clogged sky, and onto the path, where suddenly it was midnight, with the gentlest of twinklings some great way in the distance; it was indescribable. 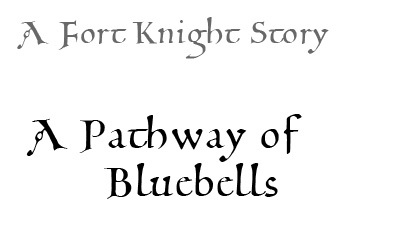 Dark blue and purple butterflies glittered through the air, as I trod a periwinkle and foxglove floor. It was too dark to see clearly, but I think I passed quite the number of drifters there, caught in perfect midnight. I almost envy them; not quite, but almost. I remember that midnight walk, when I dragged my feet yet still lasted less than an hour, so clearly, so perfectly; but then I left, and I stepped onto a highway of jagged salt, and continued my walking forward. Since then, I’ve walked so many more strange paths, the best and worst I’ve ever known. I could, and would, never trade what I’ve found for what I had; with the end of each path is the hope of finding a new one, another trail of beauty amidst all the rest. Ah, and here’s the end. What a shame. Will you be stepping off, and facing what’s next too? Well, either way, I wish you the very best of luck. Perhaps we’ll cross paths again, our feet stained with new salt, and our eyes open for new paths to follow.